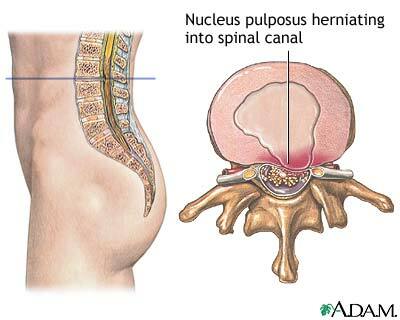 A herniated disk is a disk that has bulged out from its proper place in your back. Disks are small, circular cushions between the bones of the spine (vertebrae). Normally, disks act as shock absorbers to cushion your vertebrae from each other as you move. A herniated disk may press on nearby nerves and cause severe pain. a sudden strenuous action such as lifting a heavy weight or twisting violently. A herniated disk may also happen spontaneously without any specific injury. changes in bladder and bowel habits. Symptoms of a herniated disk in your neck may also develop gradually or suddenly. You may wake up and feel a sudden aching. Or you may have a twisted neck that you cannot straighten without extreme pain. You may also have numbness, tingling, or weakness in one or both arms. diskography (injection of dye into a disk and x-rays taken). In most cases, treatment without surgery will relieve your pain. · steroid injections into the space near the herniated disk to control pain and inflammation. · traction, which is the process of putting bones or muscles under tension with a system of weights and pulleys to keep them from moving or to relieve pressure on them. As your pain lessens, your health care provider will want you to begin a physical therapy program in which you will do exercises to strengthen your back muscles and joints. Stabilization exercises are also used to treat herniated disks. This therapy involves learning how to control the movement of your spine in all recreation and work activities. How long will the effects of a herniated disk last? The initial intense pain should go away within a few weeks, but some pain may remain for a few months. You may be prone to backaches throughout your life and therefore must remember to protect your spine when lifting or being physically active. If the weakness and numbness in your legs continue or if you lose control of your bowel or bladder function, contact your health care provider immediately. Practice correct posture when you are walking, sitting, standing, lying down, or working. When lifting heavy objects, don't bend over from your waist. Kneel or squat down by the object, while keeping your back as straight as possible. Use your thigh muscles to do the lifting. Avoid twisting. When you stand, always stand up straight with your shoulders back, abdomen in, and the small of the back flat. When standing for long periods, move around frequently and shift your weight from one foot to another while standing as straight as possible. When you sit, have your feet flat on the floor or elevated. Get up every 20 minutes or so and stretch. Sit in a chair that has good back support. Sleep on a firm mattress or one with a bed board under it. Lie on your side (never on your stomach) with your knees bent or on your back with a small pillow under your head and another pillow under your knees. What can be done to help prevent a herniated disk? Herniated disks can often be prevented by keeping your weight down, eating a proper diet, and exercising to keep your muscles firm. Strong, flexible muscles can stabilize your spine and protect it from injury. This includes keeping your stomach muscles strong. Walking and swimming are two good exercises for strengthening and protecting your spine.